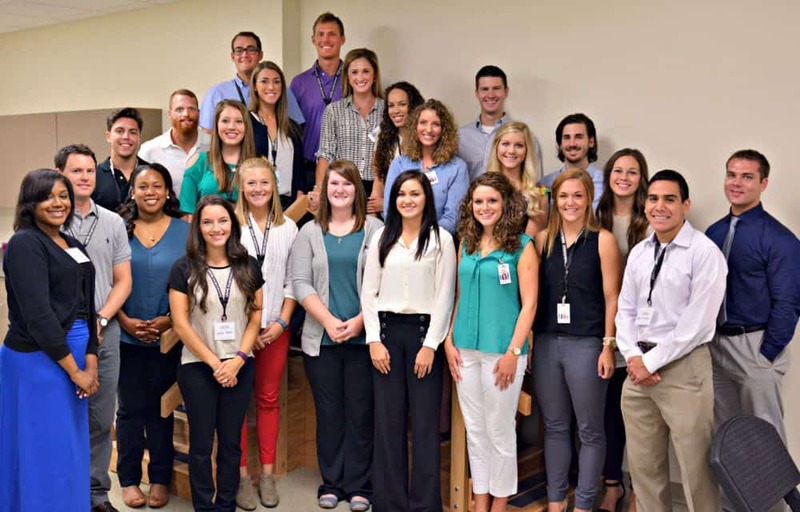 The first 24 students in the UAMS physical therapy program pose for a group photo. 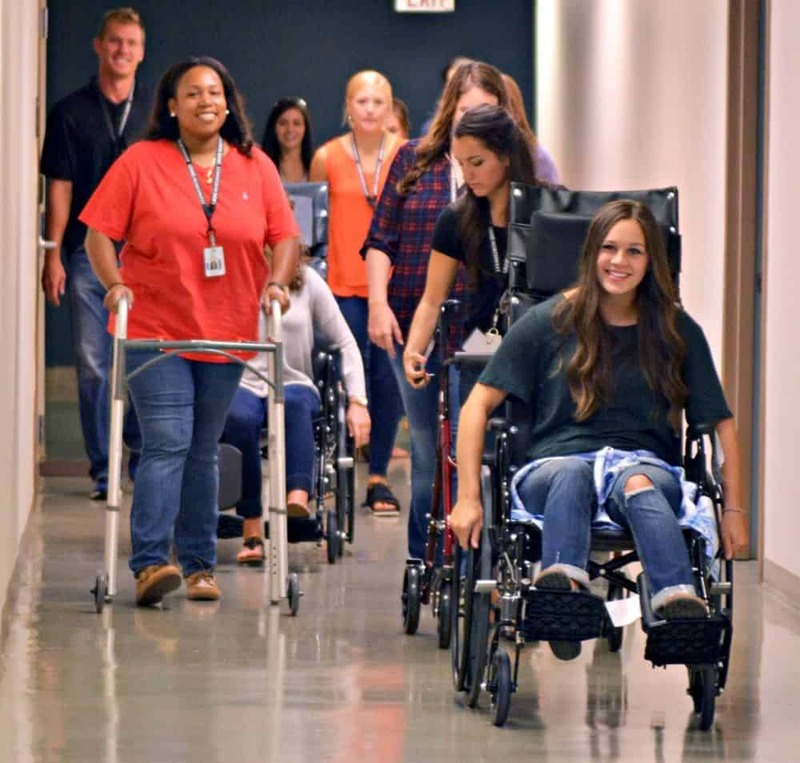 Aug. 26, 2015 | Aug. 26, 2015 | The goal-oriented nature of physical therapy work and past therapy experience proved the attraction for two of the first 24 students in the UAMS physical therapy program, which started classes Aug. 17. Gracie Frizzell of Little Rock and Scott Van Camp of Fayetteville called being part of the new program’s first class exciting. The physical therapy doctoral program in the UAMS College of Health Professions is the first program based solely on UAMS’ northwest Arkansas campus in Fayetteville. 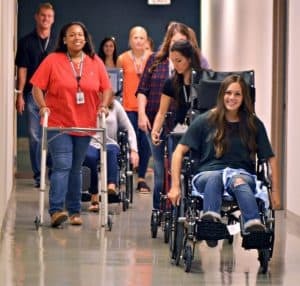 New physical therapy students get a unique campus tour, by wheelchairs and walkers they will learn to use with therapy patients. “It is very humbling to be part of such a storied school such as UAMS, and it gives me chills every time I think about how I am part of such a special moment in the university’s history as a student in the first class of the physical therapy program here,” Frizzell said. Added Van Camp: “Being part of the first class is exciting because we have an opportunity to pave the way for other aspiring physical therapists to follow. The Class of 2018 will always be the big brother or big sister that looks back and proudly encourages the rest of their family,” he said. Jefferson called the first 24 students a great group to be the trailblazers for the program. 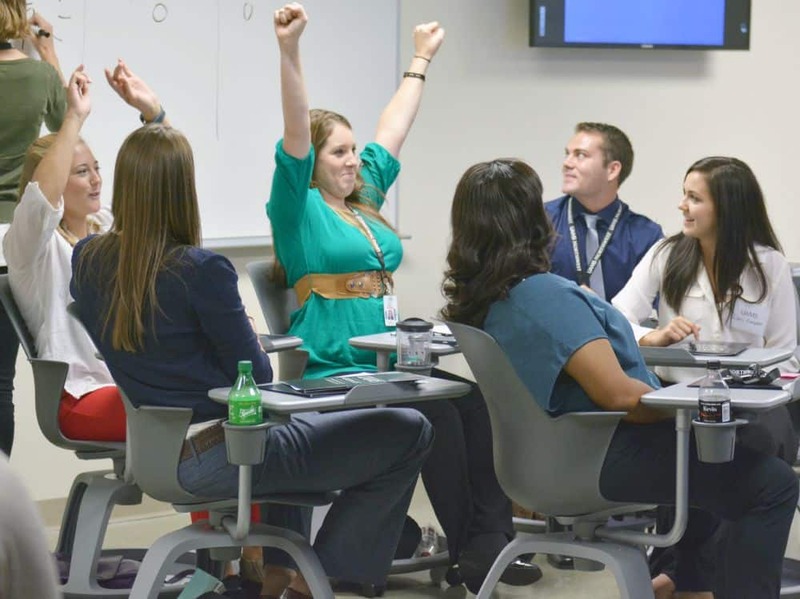 A UAMS and campus focus on active learning — emphasizing team projects and hands-on activities versus lectures and listening to presentations — is exciting for students and faculty, he said. “Plus, these students are now at the point in their academic career where, for every class they take, they will know why they are taking it and that it will have a direct effect on their career,” he said. Frizzell traced her interest in physical therapy to her time playing college basketball at the University of Mississippi. Throughout her years playing basketball, she said, she dealt with broken bones, ACL injuries and ankle sprains that sometimes required therapy. The students also engaged in some of the therapy activities. After the first few days of classes, he said the classes were demanding as he expected and will require good time management skills. The program’s academic facilities include classrooms and five teaching labs, led by the Schmieding Neurological Skills Lab, to be used to teach evaluation and treatment of those with neurological disorders including developmental disorders, spinal cord injuries, stroke and conditions such as Alzheimer’s and Parkinson’s disease. Other teaching labs will focus on orthopedic and cardiovascular conditions and disorders that require physical therapy. The program’s resources include the Northwest Outpatient Therapy Clinic that opened on the campus in late 2014. In the 2,735-square-foot clinic, experienced therapists provide comprehensive physical, occupational and speech rehabilitation services, using top-of-line therapeutic devices. Physical therapy students will gain hands-on therapy experience working with clinic patients under supervision of faculty and clinic staff.